Ragan Bowie drives in for two of her 14 points on the night during Grapeland's 96-6 win over the Latexo Lady Tigers. 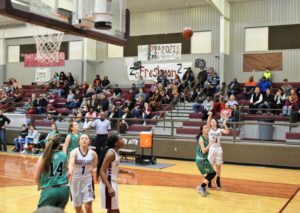 GRAPELAND – The Latexo Tigers are in the middle of re-building their basketball program and while they have made quite a bit of progress this season, Tuesday night’s game against the Grapeland Sandiettes showed they still quite a ways to go. The Sandiettes were simply too strong for the Lady Tigers as Grapeland won by a final score of 96-6. The game was basically over after the first eight minutes of play as Grapeland dropped 37 points on Latexo while the Lady Tigers only scored one on a Madi Catoe free throw. Grapeland was paced by Kenya Woods with nine points in the period while both Tatiyanna Bowie and Teira Jones had eight. Three other Sandiettes – Ragan Bowie, Hannah Chipman and KeKe Harris – all had four apiece as the Sandiettes raced out to a 37-1 lead after the first quarter. 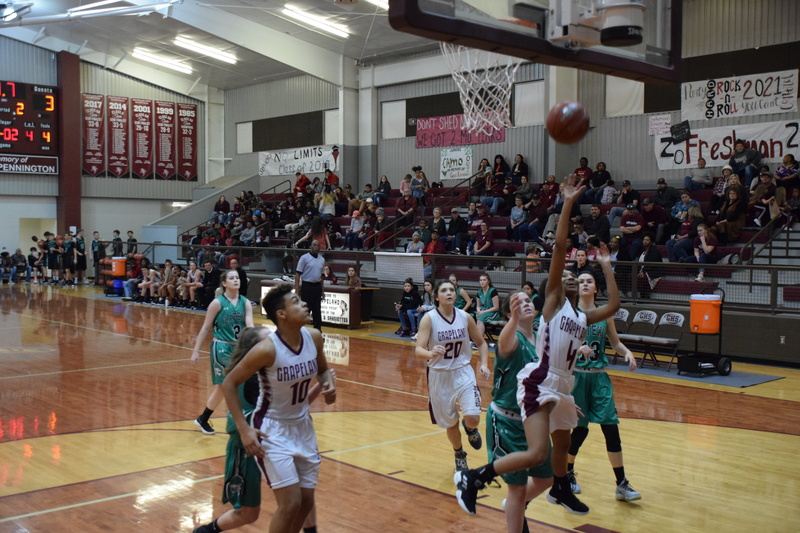 Things did not improve much offensively for the Lady Tigers in the second quarter as Catoe scored the only two points in the quarter for Latexo. Grapeland’s Tori Woodford puts up a three during first half action against the Latexo Lady Tigers on Tuesday. The Sandiettes won the contest by a final score of 96-6. Defensively, Latexo did show some spark as they held the Sandiettes to 22 points in the second. Harris led the Sandies with six while both R. Bowie and Harris added four apiece. T. Bowie, Chipman, Jones and Aeriannia Granderson all had two each to make the score at halftime 59-3, in favor of Grapeland. The Third quarter saw the game move outside the three point line as Catoe dropped in a three-pointer for the Lady Tigers. T. Bowie stayed inside, however, and put up eight points. Four Sandiettes connected from behind the arc for three apiece. R. Bowie, Granderson, Harris and Jamiyah Bowie all dropped in a three-ball to make the score 79-6 after three periods of play. With the game well in hand, the Sandiettes turned down several scoring opportunities to work the ball around the perimeter of the Latexo “D.” As a result, Grapeland’s Christy Shepherd was the only player for the Sandiettes to score from inside. Everyone else shot from three-point land. Tori Woodford drained a pair of threes while J. Bowie, R. Bowie and T. Bowie all connected on one to make the final score Grapeland 96 and Latexo 6. On the game the Lady Tigers were led by Madi Catoe with six points. The Sandiettes were led by Tatiyana Bowie with 21 points and Kenya Woods with 18. R. Bowie had 14 and Teira Jones put up 10. KeKe Harris dropped in eight while Jamiyah Bowie, Hannah Chipman and Tori Woodford all had six. Aeriannia Granderson added five and Christy shepherd chipped in two to round out the Grapeland point production.